Tunisia has passed yet another test on the long road to democratic consolidation. The election on Baji Caid Essebsi as the first freely elected president of Tunisia comes at the heels of his party’s legislative victory last month. Indeed, these have been two glorious months for Essebsi’s Nida’ Tounes, and for Tunisians’ path towards setting democratic, peaceful transition of power amidst the abysmal failure of the Arab uprisings. In purely democratic fashion, The 88 year-old Essebsi received a concession from former interim president Moncef Marzouki, and pledged to be inclusionary of the different political movements in Tunisia. 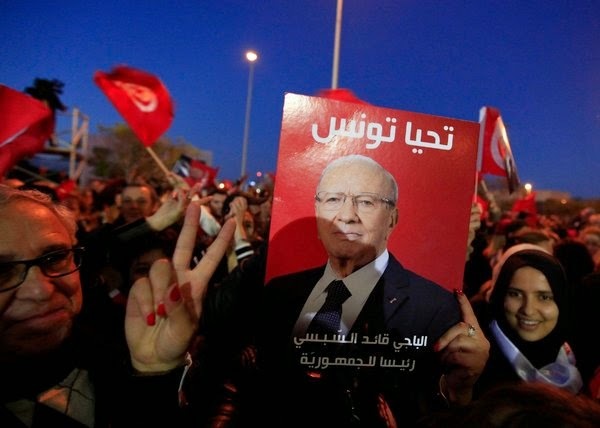 Essebsi’s majoritarian victory is not one of democracy against Islamism as some may suggest. The two aren’t mutually exclusive and such dichotomy is reductionist and essentialist. Islamists are not monolithic and most of them are committed to democratic principles. Essebsi and Nida’ Tounes’s electoral triumph (Essebsi's 55.68% to, interim president, Moncef Marzouki’s 44.32%) is simply a statement of whom the Tunisians electorate entrust at this particular juncture with the colossal task of economic and political development in the country. Nida’ Tounes and Essebsi now control both the executive and legislative branches of government. This presents tremendous challenges for the secular octogenarian Essebsi, and his secular party to deliver where the defeated Islamist Ennahda failed. In particular, Tunisia’s new leadership has now a complete mandate to tackle security issues and reinvigorate the flailing economy. Furthermore, Essebsi, a former interior minister in the repressive Bourguiba era, and speaker of the parliament during Ben Ali’s autocratic state, is now a legitimate custodian of this transition, and has to work to further entrench democratic political practices and governance. While free, fair, and competitive, last week’s elections do not signal that democracy is the “only game in town” in Tunisia yet. Tunisia’s institutions must be imbued with mechanisms for inter-institutional accountability, especially when it comes to building an independent judiciary. Without such strong foundations for horizontal accountability and rule of law, Tunisia’s nascent political experiment will never fully succeed as a truly democratic state, and could risk devolving into more of a Latin American model of delegative democracies, whereby electorally-chosen presidents ushered in a tradition strong presidentialist systems, and wielding greater power than other branches of government, amidst absent patterns of representation. Tunisia must steer away from South American presidencialismo, and institute a genuine system of institutional checks and balances. Tunisia has so far shown great attitudinal and constitutional proclivity towards the democratic process. Tunisians increasingly believe that political change must be performed within democratic parameters. Government and non-government forces have shown, even with the Islamists of Ennahda, that the resolution of political conflicts is negotiated through pacts, democratic laws, and institutions. It behooves Tunisia’s new political elite to further consolidate legal and political institutions, and to strive to keep Tunisia as the only ray of hope in the maelstrom of the post-Arab uprisings.